#1 – What technology is being used? 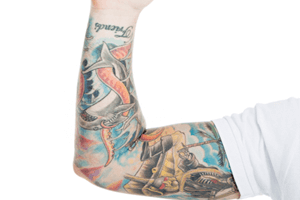 There are many different lasers on the market that can be used to remove tattoos. This does not mean they will all provide the same results. Would you buy a car from someone before asking what model and how old it was? The same principle applies to Picosecond lasers. Just because they tell you they have a Picosecond laser system, means just as much as me telling you I own a car. You must research far more into the brand and its capabilities. The Quanta Discovery Pico Plus is a leading high-end Italian made unit and is our chosen method through extensive research to treat all tattoos. The only way to remove lighter colours of ink (blue and green) is through the use of a Ruby laser. The Quanta Discovery Pico is one of the only all-in-one units, which can target all colours in the spectrum. Some lasers claim to use all three required wavelengths (ND:YAG-1064, 532 and Ruby 694) but in actual fact they filter light through a diode filter. This is unfortunately used in many machines on the market and at best you can expect only lightening of your ink when this is used. Ask your clinic prior to treatment if this is their method of removing lighter inks. If they are using an inefficient and consumable dye hand-piece, you are much better off being treated by a true Ruby laser to gain real results sooner rather than later. If you have any doubts as to whether you are being treated by the right technology for you, contact us at the clinic and we can go through this with you. #2 – Does your laser technology have a squared beam? Think about trying to evenly colour something in with dots… This makes no sense. By using a real “flat top” and squared beam profile, the Quanta Discovery Pico is able to evenly distribute energy and accurately treat the area with little overlapping. Most other inferior systems use a circle beam to treat tattoos. When trying to target a particular area of a tattoo (if you don’t want the whole piece removed) or a straight line, this becomes very difficult without a square beam. It is also quite common that in many of these lasers, the energy can be unevenly distributed resulting in “hot spots”, where the bulk of the energy will direct to the middle of the circle leaving the outer circle with little fading after treatment. The fact lasers are still operated using circle beams is one we are still scratching our heads over. #3 – Can your laser technology use a range of spot sizes? 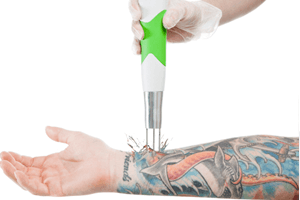 To quickly and accurately treat tattoos of all shapes and sizes, especially very large or very small and intricate pieces, a range of spot sizes from 2x2mm, 3x3mm, 4x4mm and 5x5mm are required for best targeting and treating all tattoos. If the clinic does not have this available, they will either make treatments take much longer than is necessary, or be unable to target fine lines and intricate details. If they do not offer this range it is most likely due to a lack of available power. The Quanta Ruby Laser has 1000mj of available power, where as the inferior and most commonly used system on the market with consumable dye hand pieces (for targeting blues, greens and reds) only has a maximum available power at the skin of 150-250mj. What this means is, as your tattoo fades, it is highly unlikely that there will be enough power to remove the faded pigment of your tattoo. 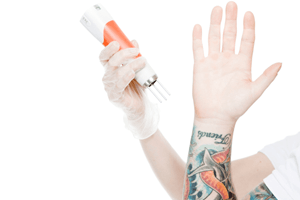 #4 – Does your clinic specialise in Tattoo Removal? Is somebody who specialises in tattoo removal treating you? Or does your clinic spend their days focusing on other unrelated treatments such as hair removal? It is important to be treated in a specialised clinic where Tattoo Removal is the sole focus of the business. This ensures that you have access to the knowledge and experience of a person that spends their entire days focusing on the one procedure you need to be treated for – tattoo removal. After all that is what you came for right? #5 – Is your clinic qualified to be treating you? The tattoo removal industry is shockingly unregulated in New South Wales. After a short theory test with no hands on experience, a person can legally pick up a laser and begin treating you. This of course will most likely result in scarring or disfigurement. 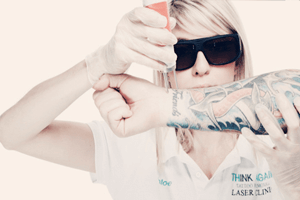 All the specialists at Think Again Laser Clinic are college educated in ‘Skin Science For Tattoo Removal’, are qualified ‘Laser Safety Officers’, and have undergone extensive practical training and assessment by the experts at Quanta systems prior to being certified on this equipment. You are paying to be treated by an expert, check their credentials prior to moving forward with treatment. If they are legitimate, these credentials should be displayed in the clinic. #6 – Does the price sound too good to be true? If it does, it almost certainly is. With any procedure such tattoo removal, the old saying applies- You get what you pay for. For this level of technology, Think Again Laser Clinic offers some of, if not the lowest prices in Sydney. Use our price list as a guide, however just as not all tattoos are the same, the price we charge is determined accordingly. if you are hearing of extremely low prices, you need to ask more questions and research the technology being used. Unfortunately there are still places using IPL lasers made for hair removal to remove tattoos. Along with this through our research we have also found businesses operating technology that they themselves cannot tell you the name of, or using inferior replica technology which is poorly made out of places like Korea. This will almost always result in permanent damage or no results at all. Do your due diligence to ensure you are being treated by the correct laser for the procedure. #7 – And finally, does it feel right? When you go into the clinic for consultation, you should be left with absolutely no doubts about the process, technology and expertise of the people. If it doesn’t feel right, don’t risk it. Tattoo removal is something that can be executed well if the operator is skilled and equipped with the knowledge to perform it. If not the risk of permanent damage is far too great to risk not being 100% comfortable prior to treatment. We cannot stress the importance of getting this right the FIRST time. We are presented with many clients who have been treated elsewhere that are unfortunately left covered in scar tissue and/or with little or no fading. The scar tissue then makes removal MUCH more difficult, if it is still possible at all. Laser Tattoo Removal should be a safe and easy process if being treated by a certified specialist; ask questions and make sure you are getting the service and results you deserve. Feel free to contact our clinic with any questions you may have about our process or ask us in person during your free consultation. Its time to ‘Recreate The Skin You’re In’.